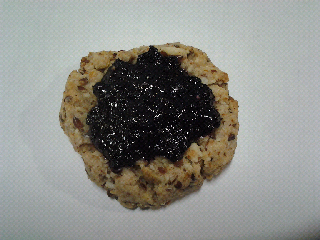 If you want quick cookies and you have some tasty jam on hand, try the recipe below! 1. Use food processor or something like a Magic Bullet to grind almonds and oats to coarse meal. (not fine like powder, but not as chunky as if you just choped them with a knife.) Add almond and oat coarse meal together with flour in a bowl. 2. Mix maple syrup and oil in a separate bowl, then slowly incorporate mixture into dry ingredients. Make sure it's sticky enough to form into balls, use your own discretion if you need to add more liquid or dry ingredients. 3. Form balls ( size depends if you want bigger cookies or smaller ones), place on baking sheet, then flaten with a large spoon to make them cookie shape. Make sure cookie is thick and then take a teaspoon and press down the middle to create a valley or crater in the middle of the cookie. 4. Freeze cookies for 5 min, this will help them hold their shape when they bake. Spoon adequate amounts of your favourite jam into the crater and bake cookies for 10-15 min at 350 Farenheit, checking regularly so they don't overbrown. What's your favourite jam that you would use? Posted by Scrumptious Vegan at 6:12 p.m. I am trying these now. I used strawberry and raspberry preserves. April 18, 2012 at 7:45 p.m. I made these for my (non-vegan) co-workers, they went over quite well! I used strawberry preserves and raspberry jam. April 25, 2012 at 4:46 p.m.
@Denise, that sounds lovely. I wanted to make mine with strawberry jam too, but I ran out. Hope you and your coworkers enjoyed them! May 9, 2012 at 2:30 p.m.